What does it mean for the Jiu Jitsu fighter? Observing nature it is evident that animals regardless of their species are born ready to fulfil their role and become what nature intended them to be. A few examples: Cockroaches as soon as they hatch go about their lives freely. A baby gazelle already knows how to stand up and run as soon as it takes the first breath outside its mother’s womb. A tiger cub becomes an independent and skilled hunter by a few months old; as it knows its survival depends on it. In the other hand, a human baby is completely vulnerable and dependent on his parents and his environment to take care of him for several years in order to help him survive and acquire the qualities that will shape him as a person, an individual and human being. Among animals, their species will determine their behavior patterns and what they will instinctively do, without leaving them any options. All they have to do is grow in size and they are ready. Their brain and desire are only serving them to eat, drink, find shelter and preserve their species. Among humans, we also have a specific growth pattern that characterizes our species, but we have additional factors that defy the limits of what we can or cannot do as species. For instance, you will not see a tiger flying, but humans have long broken this barrier. As humans we crave more than the basic needs of every living animal and unlike tigers we are born with a diverse set of qualities and we are capable of learning and adopting other humans’ qualities, as well as the qualities of our environment to fulfil our desire for self-actualization. For some people the choice of practicing a martial art was a natural call, for others, it appeared out of necessity and even curiosity. Some of us were born with the qualities of a tiger and naturally can fight. Some of us have to learn it. 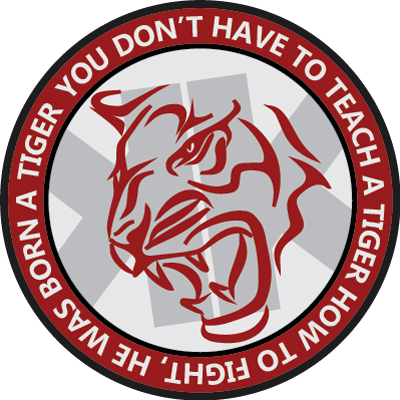 For those “naturally born tigers,” to be aggressive and ready to fight is as second nature as breathing in and out is. The problem is that we are more than animals. We are humans and if we try to imitate a tiger, we are giving up our freewill to learn how to fight in an intelligent way, in a humane way. This is what Gracie Jiu Jitsu does: it teaches us how to better utilize our “tiger qualities,” if they are already inherited in us, or it teaches us those qualities, without losing focus of our sensible human ways. I know most of my students enjoy the human/tiger analogy. I use it because it helps us understand that we must allow ourselves to learn from other humans and not simply imitate a tiger before we understand the evolutional process humans have undergone and are still going through. The tiger did not need that. It was born a tiger and already has everything it needs to be a tiger. We, humans, were living in caves thousands of years ago. Today we’ve greatly changed and expanded that based on the information passed on from a generation to another. The tiger did not change much, if at all since then. Nature only changes to keep its equilibrium. Humans change because it is in our nature. We have our egos to drive us towards the changes that can balance us and brings us fulfillment. It all lies in our desires and how we perceive the world around us. For instance, when a human sees that his neighbor bought a new car, he wants a new car too, or a new house, a new gi, a new belt, etc. The squirrel does not care about what the chipmunk has or not or what color belt he wears. In other words, what I am trying to say here is that the difference between us and the animals is that we are able to purchase desires and ideas from others and because of this fact evolution has gotten to its current point. I always have to compare myself to another human being and in order to justify myself as a human I have to compete with other humans, or at least this is what society, other humans, has taught us so far. If I could change myself and use my ego to contribute to the whole academy, to my team, to the humanity, instead of just for me, I can then use this freewill without jealousy or destruction and only with and for consistent growth and wellbeing of myself and community. I cannot cancel my ego since this is my nature, but if I just change my intentions, then I am not ruining anything in our society. Unlike the animals that do not desire more than what they need, we do. If we change our intentions on how we do this then we can live in a society and support each other, learn from our differences and accomplish the best of what our potential allows us. I believe Gracie Jiu Jitsu is a great tool to accomplish that. It resonates directly with our nature and ways of doing things. It helps us work our physical abilities just as much as it helps us “tame our inner tigers,” giving us the opportunity to improve in all aspects that make us unique individuals and contributors to our society. Great stuff professor. I agree with every word.